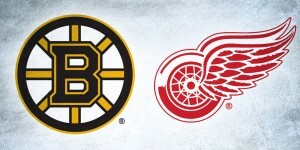 It’s been just about a month since the Blackhawks clinched their third Stanley Cup in twice as many years and Ben Bishop’s glow-in-the-dark Tron mask was crowned bucket champion, but for the artists who design for the NHL elite, the countdown to October 7 is already on. We may still be in the dog days of summer, but artists like Dave Gunnarsson and David Leroux have already begun cranking out new masks for opening night of next season. With the game of musical goaltenders that’s been taking place around the league between trades and free agency, this summer is sure to bring a tidal wave of new designs, but let’s take a look at some of the early releases for next season. “Mad Max Mask.” Try saying that ten times fast. 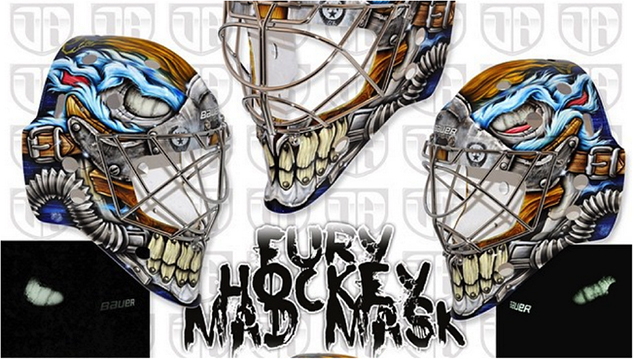 Following a long history of gladiator/monster/beast masks, Gunnarsson has revealed the next iteration of Rinne’s signature style: “Fury Hockey Mad Mask,” a design inspired by villain of the blockbuster film, Mad Max, Immortan Joe. Like many of Gunnarsson’s recent designs, Rinne’s sinister new bucket uses the Daveart signature G.L.O.W. Tech FX paint to illuminate the eyes and teeth around the chin. While the inspiration here is drawn primarily from the film (maybe Pekka is a big George Miller fan? ), Gunnarsson managed to sneak some Predators themes into this incredibly complex design. “Behind the badass mask with tubes and horses teeth you will find the Predator monster,” Gunnarsson explains on his Instagram page, presumably the same monster that he’s interpreted time and time again on Rinne’s masks. 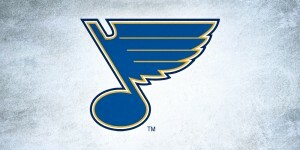 Some diminutive Nashville and NHL logos are also dispersed throughout the design, reining the out-there concept back down to its hockey roots. 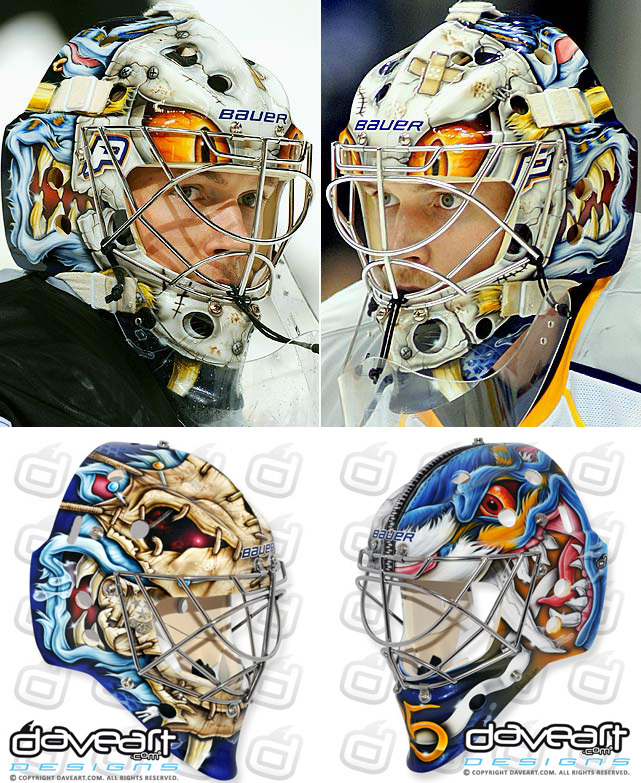 In last year’s analysis of Rinne’s monster mask, we mentioned the color scheme and overabundance of detail as being a hinderance to the design’s overall success. While Gunnarsson certainly hasn’t scaled back all of his incredible detail work here, the tubes on the sides and color blocking in the hair help define and break up this insanely complex work of art. The choice of interpreting Immortan Joe as a blue and yellow creature was also a smart one, adding another small nod back to the Predators branding. Via his instagram page, Gunnarsson promises more work with Rinne to come this summer, but overall, this is a vast improvement from Rinne’s past designs, and perhaps the maddest mask yet. 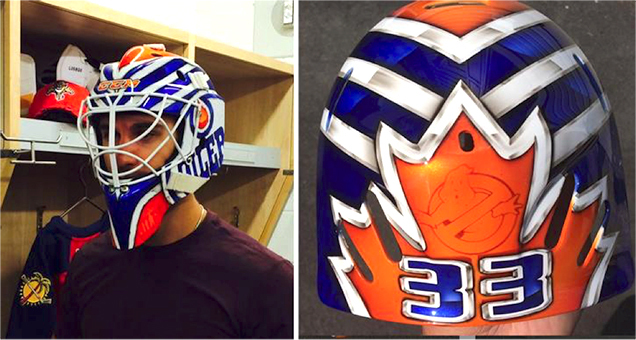 After his offseason departure from the New York Rangers, we knew Cam Talbot’s slimy big apple Ghostbusters mask was sadly going to be retired, but not one to disappoint, Talbot debuted a slick new Oilers mask by artist David Leroux that stays true to his signature blockbuster theme. In a series of posts on Leroux’s Instagram page, he shows off the crisp, geometric design, complete with Oilers and Ghostbusters logos, that was allegedly finished in under 24-hours. Wait, what!? 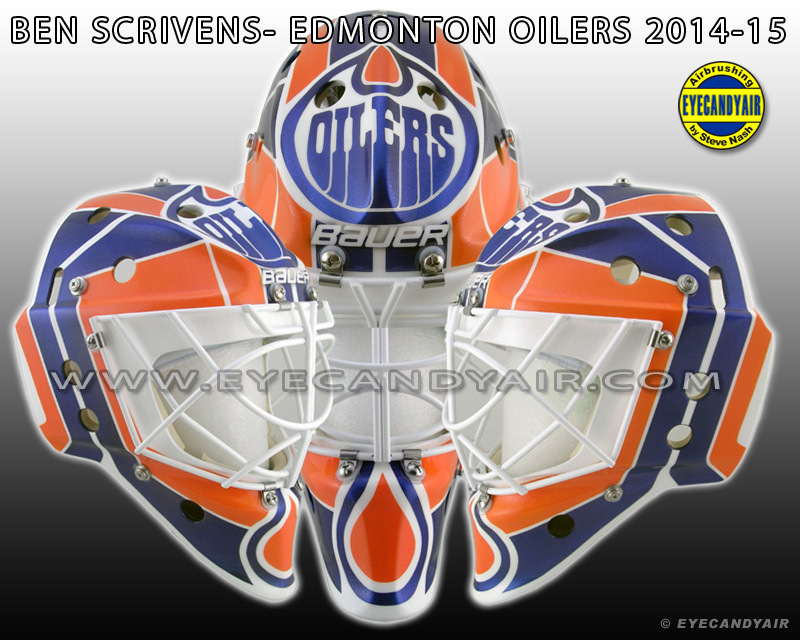 Not unlike Ben Scrivens’ Eyecandyair bucket from last season, Leroux took a very graphic approach to the blue and orange design, weaving in more subtle elements like repeating oil droplets and chrome effects to create visual interest in the mask. 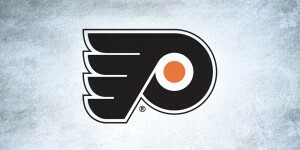 Bottom line, this kind of aesthetic is prime for an NHL setting, as it works extremely well from a distance and stands out on the ice, while more intricate and detailed masks tend to lose their punch when viewed on television or from the upper balcony seats. Leroux does a great job time and time again at crafting crisp, clean designs such as this one that we’ve come to expect this sort of style from the talented Quebec-based artist. It would appear however that Talbot isn’t content with having just one mask, or even working with only one artist this season, as mask machine Dave Gunnarsson has already teased a piece he’s working on with the netminder on his Instagram page – stay tuned! 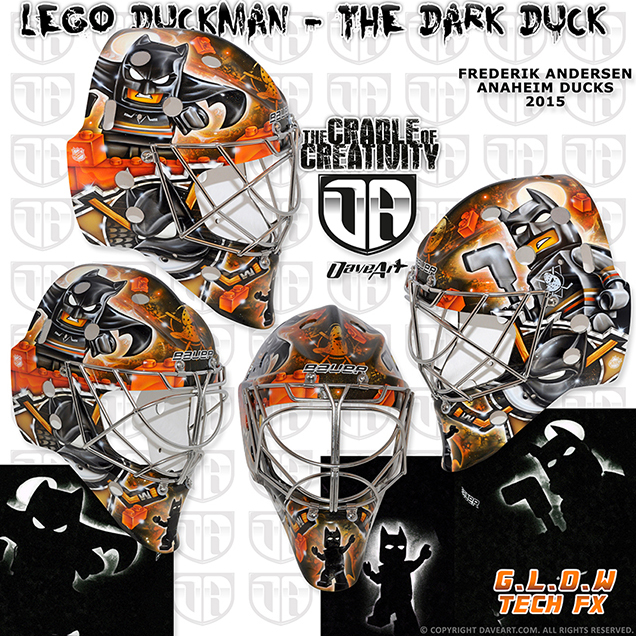 Like in last year’s design, Gunnarsson seamlessly merged the legos with the Ducks’ throwback branding, putting the Bat-duck character in a black and orange Mighty Ducks jersey and playfully giving the iconic mighty duck logo a batman mask (complete with ears) on either side. And because no superhero mask would be complete without some glow in the dark paint, Gunnarsson uses his signature G.L.O.W. Tech FX to create ominous glowing shadows behind and in the eyes of the DuckMen throughout the mask. While it might have been nice to see the Ducks’ current primary logo incorporated somehow, the floating legos and Mighty Ducks logos throughout the design add a nice subtle element that ties the two themes together. Bottom line, this mask is a total standout, and it’s sure to generate as much, if not more buzz, than its predecessor.